How do I Convert a Work Order into an Invoice? The Work Orders (WO) application allows you to easily manage and dispatch resources to address customer problems on-site. It also provides a method for employees to track the hours & products used to resolve each work order. Once the problem has been resolved, you can invoice the customer from the Work Orders app. Lets go through the following steps to raise an invoice. Create Work Order or select the existing Work Order. 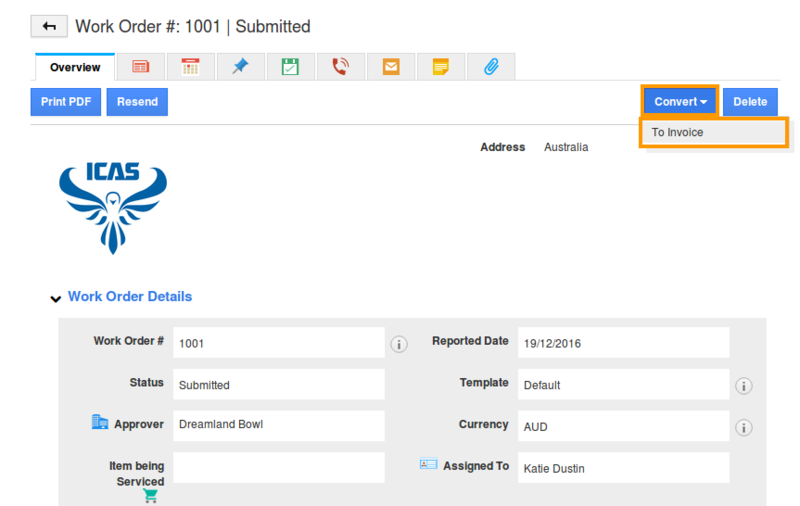 Click on “Convert” drop down found in the top right corner of the overview page to convert the Work Order into an Invoice. Convert estimate to a workorder. App integrated with work order.